Over the last two decades, there have been growing concerns about the adverse effects of conventionally grown produce on our health and the environment. As a result, more and more consumers are choosing to buy organic foods. 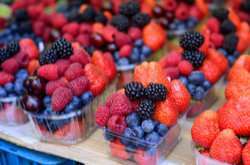 However, organic fresh and processed berries and fruit are still only available in limited quantities and are also highly perishable, with one third to half of the produce being lost due to spoilage. Since 2015, the EcoBerries project has been finding solutions that can meet the growing demand for safe and healthy berry products produced with quality and their environmental impact in mind. Over the last three years, EcoBerries has developed a number of solutions and technologies for extending the shelf life and preserving the quality of fresh and processed berry and fruit products. EcoBerries is 1 of 11 projects carried out under the CORE ORGANIC PLUS umbrella. Partly funded by the EU, CORE ORGANIC PLUS is a network of 24 partners from 21 European countries that has been working to initiate transnational research projects in the area of organic food and farming systems. To produce organic blueberry and kiwi juices with a longer shelf life, the project team used a process called high-pressure homogenisation (HPH). The advantage of HPH is that high temperatures aren't necessary to avoid produce spoilage. With this method, the team achieved a shelf life of 2 months and up to 40 days for blueberry and kiwi juices, respectively. Edible coatings based on plant materials, such as chitosan from mushrooms and procyanidins extracted from grape seeds, were also applied to whole berries. The coatings were found to preserve the colour and firmness of blueberries, in addition to extending their shelf life. Another area of exploration was the production of semi-dried fruits, such as strawberries, through osmotic dehydration combined with pulsed electric fields. Combining the two methods can increase the water mass transfer and significantly decrease the processing time for semi-dried berries, thus also reducing energy consumption. In a video posted on the CORE ORGANIC PLUS website, EcoBerries coordinator Marie Alminger, from the Chalmers University of Technology in Sweden, says that the developed technologies "can be very effective methods to extend shelf life and also to preserve nutrients." By using these mild technologies, she explains, "we can also limit the use of energy and we can reduce waste in the food chain." The project team has also been working on modified atmosphere packaging (MAP) as a means to preserve and extend the shelf life of fresh strawberries. Through MAP technology, the atmospheric air inside a package is substituted with a protective gas mix that keeps the product fresh for longer periods of time. The team has used upgraded software to identify the optimal concentrations of CO2 and O2 for this purpose. The further reduction of waste by including side streams from the berry processing industry has also been explored. Project partners have dried press cakes from berry juice processing, from which they have obtained different berry powders that can be used for extrusion and healthy snacks. CORE ORGANIC PLUS (Coordination of European Transnational Research in Organic Food and Farming Systems) has been funding transnational research that focuses on the development of organic food and farming since 2013.